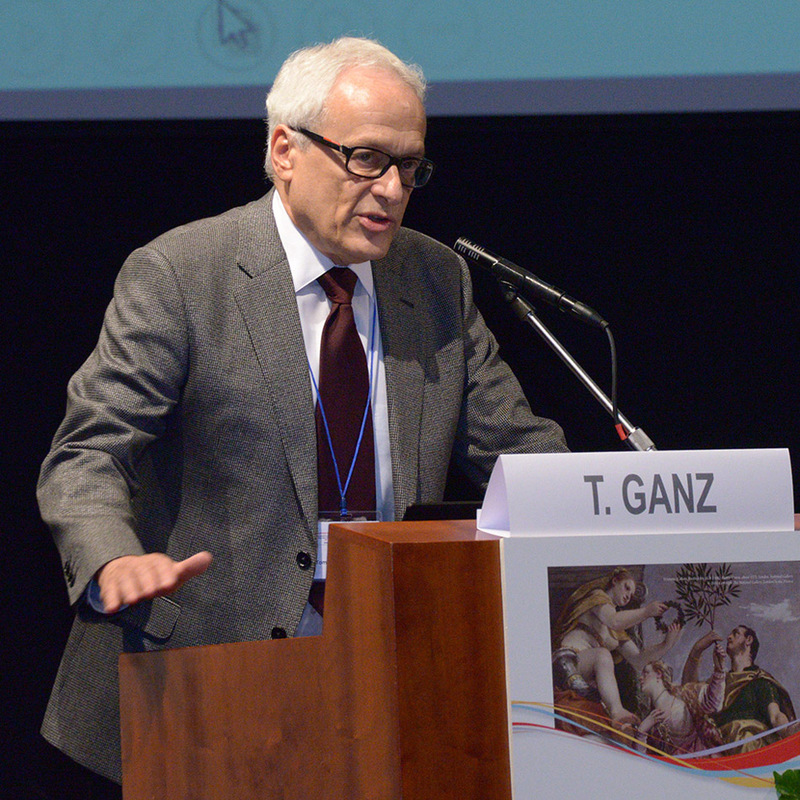 Dr. Tomas Ganz speaking at a European Iron Club meeting, Verona, Italy, on Sept. 11, 2014. Ganz believes sanguinarianism may be caused by iron deficiencies. Picture supplied by Dr. Tomas Ganz. Vamped published an article last week discussing digestive issues that sanguinarians experience. In fact, we had so much material that we decided to publish the remainder as a stand-alone interview with the doctor I contacted. I originally emailed Dr. Tomas Ganz, Professor of Department of Medicine Pathology and Laboratory Medicine at the University of California Los Angeles, after reading about him in a BBC article about people who drink blood by David Robson. Ganz’s comments on nutritive and laxative effects of blood in the article were what intrigued me enough to reach out to him in the first place. I sent him a set of questions on Oct. 21, 2015, for further elaboration—and he replied the same day. All quotes within the questions are taken from Robson’s article. Erin Chapman: Could you tell me how the writer David Robson found you for the article? Do you know each other or did he randomly contact you? Dr. Tomas Ganz: I did not know David Robson. I think that he contacted me because I am interested in iron metabolism and well known for my work in that area. EC: Do you have any affiliation with the other people mentioned in the article such as Merticus, John [Edgar] Browning or any of the vampire community members? TG: No, I do not know any of them, or any other person who deliberately consumes human blood. EC: In the article you are quoted: “Tomas Ganz at the University of California Los Angeles points out that they cannot completely eliminate the risk of infection. “Testing in sexually transmitted disease clinics does not cover the full spectrum of potentially transmissible diseases, but should cover the more common ones such as HIV or hepatitis B and C,” he says. Did you give the writer this quote specifically for the article or was it taken from a paper you have published before hand? Also can you elaborate on what diseases are being missed when this type of testing is used and the dangers associated with it? Some of these (e.g. Chagas disease and West Nile virus) are transmitted by blood-sucking insects and would not be tested for in the context of sexually transmitted diseases (here is a typical list for STD testing with discussion, http://www.mayoclinic.org/diseases-conditions/sexually-transmitted-diseases-stds/in-depth/std-testing/art-20046019 ). Neither I nor anyone else knows what the risks are for transmitting diseases through blood ingestion. This would require studies that have never been done. Did you give the writer this quote specifically for the article or was it taken from a paper you have published before hand? TG: This was a specific quote. EC: Also can you elaborate on the nutritional value of blood? Can an human ingest so much before it makes them sick? If you were to analyze say an ounce of human blood, what nutrients are present and in what quantities for example salt, iron etc? TG: I do not know what quantity of blood would make a human sick. Nutritionally, 100 ml (3.3 oz) of blood contains 12-15 g of hemoglobin (protein) that contains 40-50 mg of iron, 8 g of other proteins, 0.9 g of salt, 0.1-0.2 g of sugar and 0.1- 1 g of fat, depending on when the last meal before the blood collection was consumed. So it is a protein-rich, iron-rich, salty material. EC: You say that blood is also a natural laxative, can you elaborate on this and explain how that is possible? Can blood also improve the condition of your flora like taking probiotics does daily? How does ingesting blood orally differ from say someone with an ulcer that already has blood in their stomach? EC: Over the years have you ever encountered someone that claimed they drank human blood before or members of the vampire community? What is your take on claims made by sanguinarians that they receive health benefits from drinking blood? TG: I have never met anyone who claimed to drink blood. Some of the claimed effects of blood ingestion could be from its iron content (if a person is iron-deficient), laxative effect (if they are constipated) or a complex psychological effect. The Maasai tribesmen drink milk spiked with fresh cow blood and this makes sense because cowmilk is a poor source of iron and the addition of blood makes it a more complete nutrient. EC: In the article you said, “unconventional nutrient choice.” Can you elaborate on this comment? TG: I just meant that some people drink human blood but most people don’t and would not. They might even be offended or revolted by it. Hence the choice of drinking blood is unconventional. EC: In the article CJ! said she has been plagued by IBS which can only be cured after a drink of blood and “after consuming a sizeable quantity (somewhere between seven shot glasses to even a cup), our digestive system works wonderfully.” Can you elaborate on your thoughts about this? In theory, what affect would consuming this amount of blood have on someone experiencing IBS? TG: It is possible that the laxative effect is important here, or the blood ingestion changes the bacteria in the colon. This could affect the symptoms of IBS. EC: Do you think that this topic warrants further study? TG: There are so many higher priority nutritional problems, like obesity, diabetes, iron deficiency, etc. that I do not think it will make the top twenty list for nutritional research. Vamped published an article last week: Erin Chapman, “A Drink of Blood a Day Keeps the Doctor Away: Do Sanguinarians Have Digestive Issues?,” Vamped, Feb. 10, 2016, accessed Feb. 15, 2016, http://vamped.org/2016/02/10/drink-blood-day-keeps-doctor-away-sanguinarians-digestive-issues/.